NIGHTMARISH flashes of boarding school dinners (where the only thing edible was the paper napkin) came to me when I arrived on campus at the University of NSW and was whisked into my (surprising well-appointed) bedroom before my first group session in an AGSM Executive Program. So convinced that I would starve rather than eat poor food, I had planned on smuggling a stash of treats from my favourite Asian supermarket to survive the next five days of on-campus living. I thought of investing in a box of two-minute noodles and anticipating what a fortune I could make by selling packets to desperately hungry fellow students at highly-inflated prices. But time got the better of me and before I knew it I was locked down in my new temporary home for the next couple of hours sizing up my eight fellow students while holding their hands as we were tied to a rope (it promotes teamwork), challenging my lecturer (and a former physical trainer) to a wrestle, trying to understand the two New Zealanders at my table and getting in touch with my emotional intelligence, all the while wondering which one would betray me in the nightly group work (and you know who you are if you’re reading this). Studying (and wrestling) this hard with other high-powered professionals is hungry work and before we knew it the nine of us were in the dining room sizing up the massive lunch smorgasbord in front of us. Regrets of failing to smuggle in a box of Mama Thai tom yum instant noodles vanished when I spotted the Burmese chicken curry scented with ginger and lemongrass with jasmine rice (was I now on the path to emotional intelligence enlightenment?). It was excellent. So was the baby spinach, green and red pepper salad on mixed lettuce with miso vinaigrette with a chilli seaweed garnish. Could this be the start of things to come? Even my fellow student who decided to become a celiac for the next five days thinking she would get some type of specially tailored “off-campus” meal was stealing portions from the dishes on offer and (surprise, surprise), she could eat gluten again. There were many memorable dinners shared among us in the AGSM’s dining room but two stand out. The first was on the second to last night. Hors douvres of mini Peking duck pancake and butterflied king prawns with lime and chermoula served in Chinese soup spoons at pre-dinner drinks was followed by a main course of succulent and seasoned chicken pan-fried with white wine and butter which was served on a bed of perfectly cooked puy-style lentils with roasted potatoes and steamed broccolini. Dessert was a marvellous steamed sticky date pudding. It was fluffy yet firm, perfectly moulded and served with cream and was very ‘comforting’. A great choice as it complemented the ‘rustic’ main course we had just shared and got all of us calm and content and ready for our nightly group session. On our final night, a three-course dinner was truly the highlight of the dinners we had there. 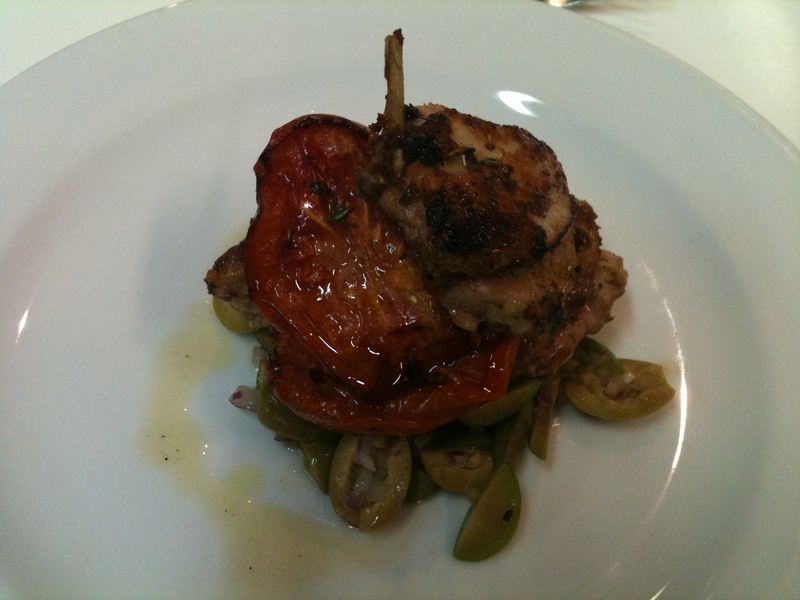 It began with an entrée of quail which was roasted and served ‘Mediterranean style’ – as it was topped with a roasted Roma tomato surrounded by a split green olive and chopped Spanish onions and drizzled with a lemon infused olive oil. If this was the entrée, what possibly could be for the main? The main course looked stunning. Out came a plate of two medium-cooked veal medallions sitting on a bed of steamed baby spinach with a puddle of onion soubise (which is a bechamel based sauce with puréed onions) to the side. 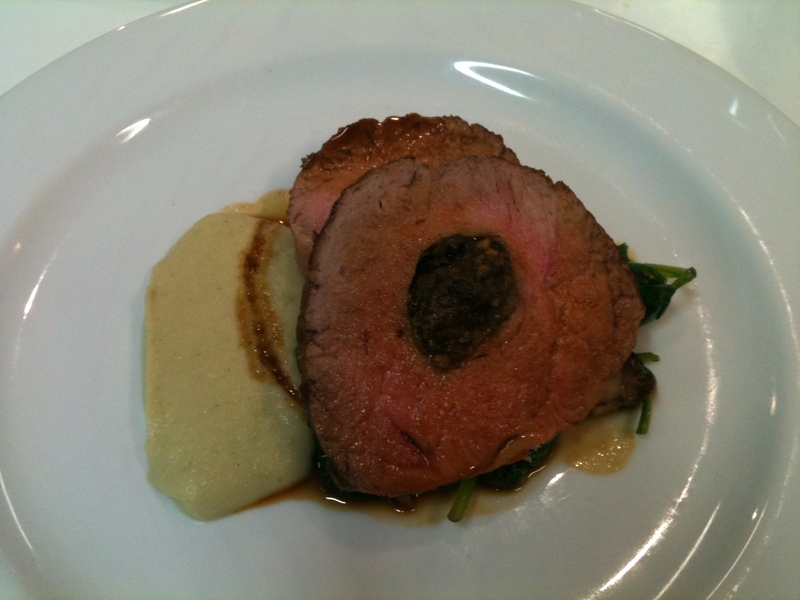 The veal was stuffed with a good dollop of mushroom ‘tapenade’ and the meat was drizzled with a veal jus. It all just melted in the mouth. 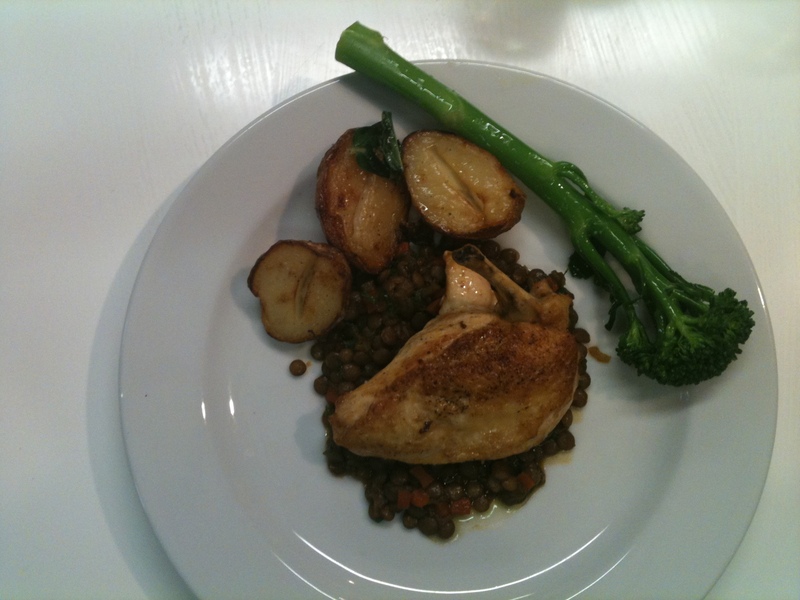 The creamy purée was light and exceptionally good – with a hint of onion breaking through. The mushroom stuffing added a further rustic earthy dimension to the veal. 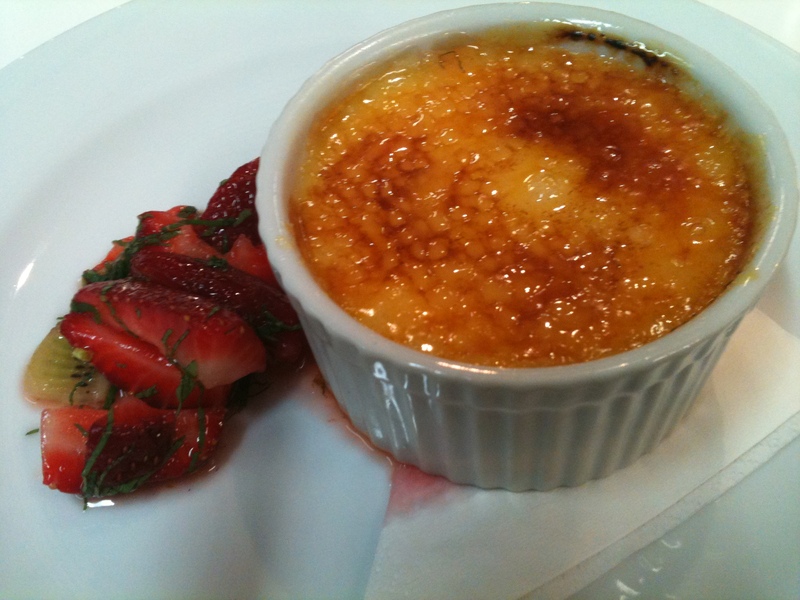 The veal was followed by a crème brulee with a side of strawberries poached in vodka with shavings of mint. It was possibly the best example of this classic dessert I have had. It was rich and creamy, with the poached strawberries on the side intensely flavoursome and sweet (the vodka draws out their flavour) which added a marvellous extra element to the dessert and acted as a mini palate cleanser – the fruit’s fruity acid and sweetness with the combination of the dry vodka cutting through the richness of the creamy brulee. The beer and wine selection was impressive too. The Mountain Goat Organic Steam Ale has now become my beer of choice (when I can find it) and the wine drinkers were well catered for with offerings such as Nine Island Pinot Gris, Campbell’s of Rutherglen Bobbie Burns Shiraz and Coriole Sangiovese (among others). Our exceptional faceless and nameless chef for the five days prepared some of the best food I have dined on in a ‘school environment’. Despite pleading to our professional and outstanding waiter Kenneth for our humble chef to show himself, he remains a mystery. Unfortunately, you can’t just make a booking at the AGSM’s dining room – the only way to experience our faceless chef’s cuisine and Kenneth’s service is by attending one of the AGSM’s Executive Programs. I found out later that Gastronomy Australia (which has some impressive high-profile corporate clients) was responsible for our feasts and is available for both corporate and private catering. If school is this good then I want more. Lucky for me I didn’t make an investment in instant noodles. Verdict: Who needs Sun Tzu’s Art of War and management books when you can win hearts and minds with such exceptional food? Like armies, management marches (and learns) on full stomaches. The program and lecturers were all top class as well. Ate there: 21 to 25 June 2010. This entry was posted in General, New South Wales, Sydney and tagged AGSM Executive Programs, Australia, Food, Sydney. Bookmark the permalink.